I have known R E Hargrave for several years now, and am so proud that she's finally going to be a published Author. 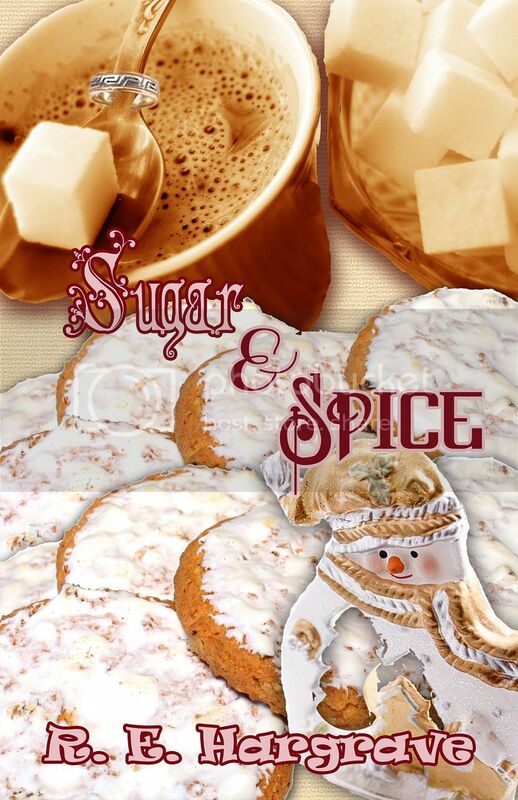 Let's take a little peek into her first offering, Sugar and Spice, and find out a little more about my wonderful friend, R E Hargrave. She shrugged her shoulders. “Not sure, just know she wasn’t there today. Coach C was.” The smile was back. “He, Mom. ‘What’s he like?’” she corrected me with a dreamy look in her eye, and it clicked. She had a crush on her teacher. This could not be happening to me. I wasn’t ready for her to be noticing boys, let alone men. “Um . . .” She licked a dab of frosting from her finger, stalling as well. “He’s got a great tan and these blue eyes that twinkle when he smiles. He is a little older, though.” She had my attention now. There weren’t any teachers at the school that fit that description, and Mr. Crouse, the history teacher I’d assumed she was first talking about who always covered in a pinch, without a doubt did not fit her description. “Childress. But he told us to call him Coach C. Oh, and he let me be captain for basketball today!” she announced with glee, unconcerned that my face had pulled into a slight frown. Why did that name sound familiar? Let’s get to know R E a little bit, shall we? That would have to be an emphatic yes. I come from a family of readers. According to my mom I used to memorize stories by hearing them before I could actually read so that I could later sit and read them to myself. Once I could really read I constantly had my nose in a book. Wow, you sure got an early start! So, what was your favourite book growing up? I was a big a Judy Blume and Beverly Cleary fan in grade school. Tolkien was an early favorite as was Jane Eyre. In middle school I went through a Robin Cook phase which transformed into Stephen King and Clive Barker in high school. Anne Rice came next followed by Stephenie Meyer, Diana Gabaldon, Laurell K. Hamilton and J.R. Ward. Guess I kind of got off track there! Short answer? I think I'm still growing up and I rarely meet a book I don't like. That’s wonderful. Do you have a favourite genre and if so, what is it? I would have to say paranormal. I've always enjoyed a good supernatural tale – especially if it has vampires. Oh me too. When was it that you were first inspired to write, and do you remember what was it you wrote about? How far back do you want me to go? I can remember dabbling in poetry when I was younger. In middle school my best friend and I attempted to write a collaboration about a dragon named Rufus. However, my first real stab at writing came with a YA supernatural piece I started about six years ago. It's sitting there as a partial rough-draft and I hope to someday go back to it – when I have a free moment. What inspired you to write your story, Sugar and Spice? At first I wasn't sure if I was going to take the challenge of churning out a novella in just one month (I wrote it in three weeks). However, the more I thought about it the more I resigned myself to the positives of completing the task. My next piece will not be for young readers, but this one is which means my first ever published story is something that my kids can read – and have. My nine-year-old daughter – who was the inspiration for Candace Harrison – was a fantastic cheerleader and pre-reader for me. She even drew a cover for me! I'll add here also that a very close friend of mine was the inspiration for my main character Lacey – sounds like Lisa doesn't it – Harrison. *Giggles* sure. It did take me a couple of days of thinking on the theme Renaissance Romance Publishing was looking for. It was pretty vague meaning the possibilities were wide open – romance and a winter holiday needed to be included. Traditions, family, small-town – all of these were ideas that kept sticking in the front of my mind and once I committed to using a setting that was part of my childhood, the story unfolded from there. It’s wonderful when you can draw from your own experiences to add truth and dimension to a fictional world. Can you tell me a bit about what you have planned next? *Rubs hands together* As I mentioned above, my next project will not be for young readers. It will be released under Renaissance Romance Publishing's Sensual Awakenings line – for adults only. I am currently working on a three-book series which I've dubbed The Divine Trilogy. Yes, in full disclosure I am not hiding the fact that parts of the books will be rewrites of the first fanfiction story I wrote – To Serve Is Divine. I love the fanfic title so I am keeping it and reusing it. The difference is that it is being used in book 1 which is all brand-new material with the exception of about five chapters which are revamped material. To Serve Is Divine will introduce readers to Jayden Masterson and Catherine O'Chancey as they get to know each other and test the boundaries of their relationship and themselves. It is slated for a January 22, 2013 release and will be available in paperback, multiple e book formats, and audio book. The two remaining books in the trilogy, A Divine Life and Surreal will follow in approximate six month increments. I have had the honour and privilege of reading the original story, and reading it is, in fact, how I met my friend, the wonderful R E Hargrave. I’m very much looking forward to checking out the new and expanded version of To Serve is Divine, and the next two books in the series, as well as getting my teeth into the upcoming first published work Sugar and Spice. Thank you so much my dear friend for joining me today. I can't wait for Sugar & Spice to come out! And the Divine Trilogy is also something to really look forward to!